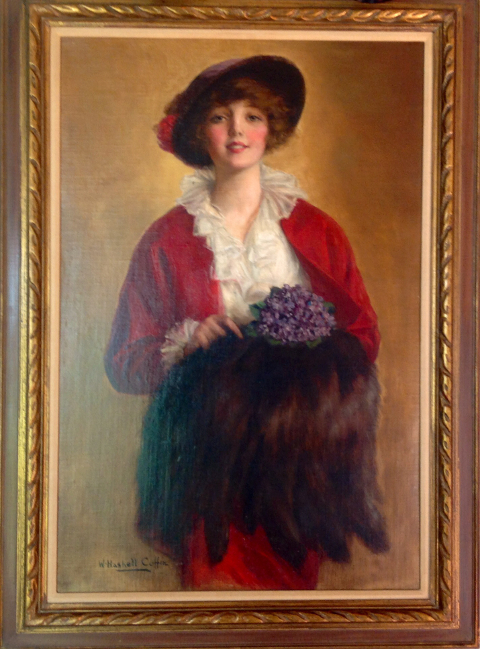 This pretty girl oil on canvas painting was created by Haskell Coffin for the cover of the Fall and Winter 1914-1915 catalog for Perry, Dame and Company of New York. This is a large painting, at 33" x 45", and is a great example of his work. William Haskell Coffin was born in 1878 in Charleston, South Carolina. He is best known for his portraits of pretty women. Coffin began studying art at the Corcoran Art School in Washington. He received a scholarship at the Art Student's League, and participated in many exhibitions in New York, before traveling to Paris to continue his study of art. He created many images for posters during World War I. Many of his paintings also appeared as images on magazine covers, such as Saturday Evening Post, Collier's, Cosmopolitan, Redbook, and Modern Priscilla. He also produced many calendar images for the Gerlach Barklow Calendar Co. and the Thomas D. Murphy Company. His artwork appeared on countless advertising pieces, as well. Despite his popularity as an esteemed artist, Haskell Coffin was troubled by financial difficulties, and committed suicide in 1941 just prior to the start of World War II, at the age of sixty three.